The nonprofit Bees in the D is managing a network of beehives in Detroit to offset the decline of honeybees. Honeybee populations have declined dramatically for most of the past decade. The US Department of Agriculture estimates that honeybees pollinate about $US15 billion of crops each year. Bees in the D, which launched two years ago, currently operates 102 hives. Half of them are within the city limits, and they reach as far as Canada. Brian Peterson-Roest, the nonprofit’s co-founder and CEO, told Business Insider that his team is building a “bee highway” to bring hives to nearby areas that currently do not have any. A nonprofit in Detroit is setting up beehives around the city to help increase local bee populations and educate residents about the importance of pollinators. Bees in the D, which launched two years ago with six hives, operates 102 hives throughout Michigan and nearby areas, said co-founder and CEO Brian Peterson-Roest, an elementary school teacher. Peterson-Roest told Business Insider that he started the nonprofit with his husband, Brian Roest-Peterson, after a trip to New York City. Noticing there were hives throughout Battery Park in Manhattan, Peterson-Roest said he felt inspired to help with the conservation of honeybees in Detroit. The US Department of Agriculture estimates that honeybees pollinate about $US15 billion of crops each year, including almonds and zucchinis. 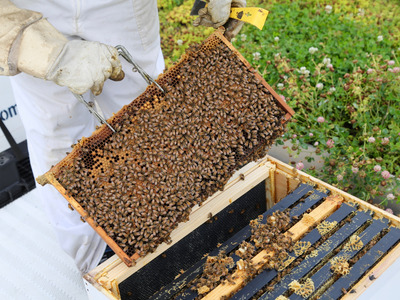 But honeybee populations have declined dramatically for most of the past decade, largely due to Colony Collapse Disorder, in which a majority of worker bees disappear from their colony. According to the EPA, the disorder is less prevalent than a few years ago, but it remains a concern. About half of Bees in the D’s hives are within Detroit’s city limits, though the nonprofit also manages hives to the west, north, and even in Canada. Peterson-Roest said he focuses mainly on the honeybees’ health by checking for diseases and parasites. He said managing more than 100 hives allows him to rotate which are used for educational programs, so he does not disturb the same hive for a long period of time. 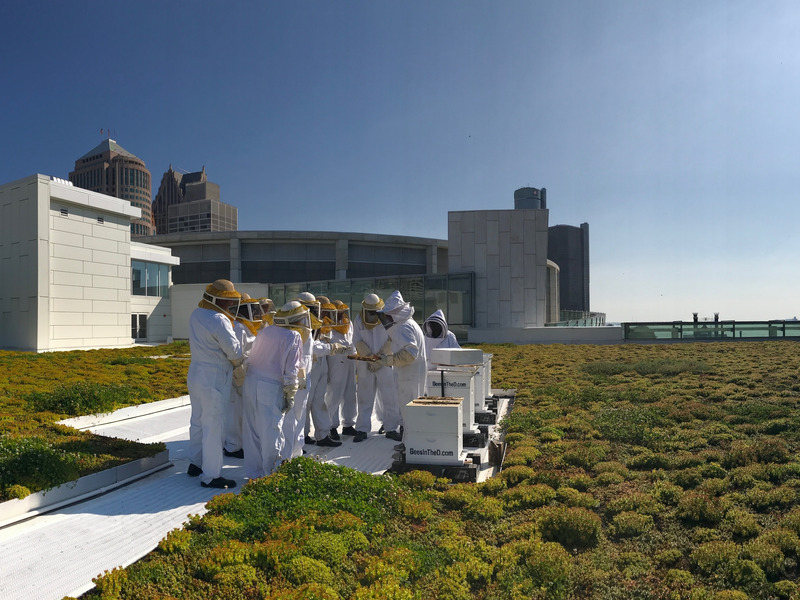 Hives can be found on top of a convention center, on the roof of a hotel, at an outdoor adventure center, and at Detroit Abloom, a flower farm and florist. While Bees in the D is managing a growing number of hives, Peterson-Roest said it is still difficult to help the bees survive in the cold due to pests. “Unfortunately, you’re lucky if even 50% of your hives are able to survive the long winter months,” he said. As the nonprofit looks to expand, Peterson-Roest said the team is creating a “bee highway,” or a network of hives that ensure honeybees have nearby access to food, water, and shelter wherever they are. The team will use maps to identify which pockets of land do not have hives, and they will add waystations of hives to fill gaps from Detroit to the “outposts” in nearby cities like Ann Arbor. Peterson-Roest added he would like to collaborate with the Michigan Department of Transportation to plan on the highway project. The bee highway is still in its early stages, as Bees in the D is working on finding business partners and securing funding, Peterson-Roest said. He noted that Detroit is well suited for urban beekeeping because it has lots of green spaces, like parks and gardens, that are not treated heavily with sprays that harm honeybees. In much of Detroit, Peterson-Roest said, wildflowers and plants are free to grow, and the open spaces are less dangerous to bees than heavily sprayed areas. Peterson-Roest said most people will be unlikely to want beehives on their property, but residents can help improve conditions for honeybees in other ways, from planting wildflowers to being mindful of how much they rely on insecticides and pesticides.